My husband, Mike and I have adopted two boys through the foster care system. Ja'Shaun is now 15 and going to be a sophomore, and Daniel is 4 years old. 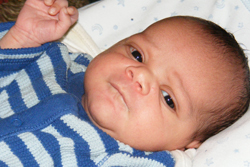 Daniel came into our home first as a 2-day-old newborn that we picked up from the hospital. There were drugs present in his system at the time of birth, which is why he was removed from his birth mother. She had previously lost her parental rights to three other children and had a long history with the Department of Child Services and made no attempt to regain custody of Daniel. After all the red tape, we were able to finalize our adoption of Daniel in December 2010 just before he turned 9-months-old. I look at him now as a 4-year-old who is so happy, out-going, athletic, musical and knows no stranger and am saddened by what his birth mother is missing. But I�m so happy that God chose us to be his parents and help him find his God-given talents. 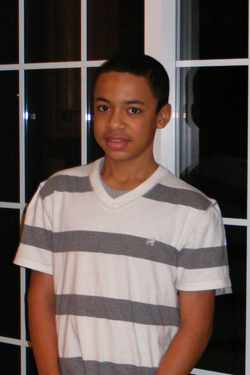 Ja'Shaun came into our home five days before his 13th birthday. He had been in and out of foster care from the time he was born. He was ready for a forever home. When we first met him he just wanted a normal life. We have had our struggles with what normal looks like in a middle-class suburban home, but things are going well. We finalized his adoption in October 2013. He has adjusted to being in the same school year after year well. (He had been in 10 before coming to us in 7th grade.) Ja�Shaun is enjoying being a part of the football and track teams. He has loved church youth group, retreats, mission trips, and Springhill Camp. The most exciting thing for us is to see the empathy he has for the kids in the low-income neighborhoods and his love for serving them. I am sure he sees his younger self in those kids and knows their struggles, hurts and dreams and he does such a good job of showing them God's love. If you are thinking of adopting, I would seriously consider checking out the Foster to Adopt option. Like any governmental agency, it is not always easy or does it make sense, but these kids want a forever home just like kids overseas, and I think the kids in our own backyard tend to get over looked when seeking how to grow our families.